Luminaries from the horse racing world gathered at Melbourne’s Mail Exchange Hotel on October 16 for the launch of race commentator Greg Miles’ much-anticipated book: My Lucky Life Behind The Binoculars. Caribou’s managing director John Craven collaborated with the record-breaking caller on the book. Miles described an amazing 40,000 races, including 36 Melbourne Cups, before taking early retirement in 2017. The race calling fraternity was well-represented at the launch. Tasmania’s premier commentator Colin McNiff, a long-time mate of Greg’s, flew in from Hobart for the occasion. Gerard Whateley, Bryan Martin and Ray Benson were also there. So was Peter Booth, a mentor of Greg’s when he started out at the ABC in the early 1980s. Former Racing Victoria chairman Michael Duffy, ex-Warrnambool Racing Club presidents Margaret Lucas and Des Roberts, Briseis Club boss Benn Ward, VRC Melbourne Cup tour organiser Joe McGrath, the “Punting Priest” Fr. Joe Giacobbe, and popular retired jockeys Peter Hutchinson and Alf Matthews joined dozens of Greg’s family, friends and media representatives at the function. The book was launched by Greg’s protégé Matthew Hill who conducted a wonderfully entertaining interview with his mentor. Matthew, a Melbourne Western suburbs boy just like his early adviser, has slipped neatly into Greg’s shoes as the voice of Victorian racing on Racing.Com, RSN, Sky Channel and Channel 7. His call of Winx’s 29th straight victory in the 2018 Turnbull Stakes at Flemington was a gem. The Caribou-organised launch of My Lucky Life Behind The Binoculars followed not long after the company’s successful staging of its high-acclaimed cycling event, the Tour of the Great South Coast, which is now recognised as the premier bike riding race on Cycling Australia’s National Road Series calendar. The five-day Campolina-Visit Victoria Tour of the Great South Coast was conducted in the South-East corner of South Australia and the South-West pocket of Victoria from August 15-19. The event was backed by three municipalities – the City of Mount Gambier and District Council of Grant in SA, and the Glenelg Shire across the border. The tour was won by the young New South Welshman Ayden Toovey from Germany’s Raphael Freienstein, with Victoria’s Nicholas White in third place. More than 100 cyclists from all Australian states, New Zealand and other overseas countries contested the 500-kilometre challenge. 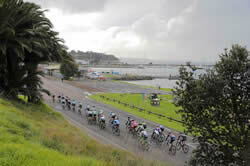 The six-stage race was the target of some ferocious weather as it trekked its way from Mount Gambier, Port MacDonnell, Heywood, Casterton and Cape Bridgewater before concluding with a spectacular waterfront criterium in Portland on Sunday, August 19. Category awards were fiercely-contested throughout the event. The coveted Carlin and Gazzard sprint championship was won by Freienstein who also claimed the Glenelg Shire criterium crown. White captured the Scody king of the mountains title, while Sydney’s Cameron Scott was an emphatic winner of the CFMEU rising star jersey. The Fulton Hogan most aggressive rider award was allocated to the ACT’s Sam Hill. 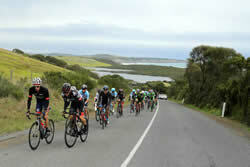 The tour, which will be staged for the eighth time from August 20-25 in 2019, received wonderful support from a wide range of sponsors, including Kevin Donovan Project Management, Heywood Home Timber & Hardware, Portland Tourist Association, Gordon Hotel, Cape Bridgewater Cafe, Mibus Brothers, Keppel Prince, and the Heywood Hotel. 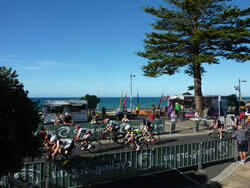 The Tour of the Great South Coast was founded by Caribou Publications in 2012 and is now the company’s signature road cycling event. Caribou is also the cycling manager of the iconic Tasmanian Christmas Sports Carnivals, first held 132 years ago and featuring athletics, wood-chopping, and criterium and track cycling. The seven-day 2018-19 Fulton Hogan Tassie Sports Carnivals will be staged from Boxing Day, December 26, until New Year’s Day, January 1. The cycling program will feature three days of criteriums for men, women and masters – at Westbury, Ulverstone and Burnie – and four track racing sessions at Launceston, Latrobe, Devonport and Burnie. (Full program follows). Riders will compete for a fantastic $100,000 prizemoney, and some of the globe’s finest performers will be on show. They will include three members of Australia’s world record-breaking gold medal-winning men’s pursuit team at the Gold Coast Commonwealth Games – Sam Welsford, Kelland O’Brien and Alex Porter. It is anticipated that more than 10 countries will be represented in cycling events. Caribou has been involved in the carnivals since 2013 and works in conjunction with the Sports Carnivals’ Association of Tasmania and Cycling Tasmania to organise and promote the series. Excellent backing is received from the Tasmanian Government, Fulton Hogan, the Meander Valley Council, Central Coast Council, Burnie City Council, the Goodstone Group, SeaRoad, Derrico Cycles, West Beach Cycles, Burnie Athletic Club, Scody, Viridian Advisory and Tasmanian Hotel & Catering Supplies. 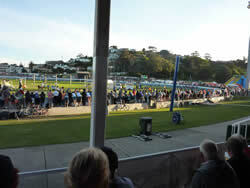 The Tassie Carnivals are a unique institution on the Australian sports calendar and provide marvellous entertainment for thousands of spectators in the North and North-West Coast of the Apple Isle during the Christmas-New Year holiday period. GREG MILES: MY LUCKY LIFE BEHIND THE BINOCULARS. By Greg Miles and John Craven.